What are Advanced Driver Assistance Systems? 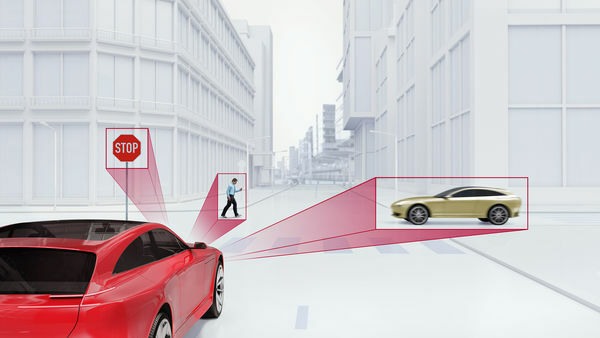 A crucial factor for success is full detection of the car's surroundings with all relevant objects. This includes reliably predicting how a traffic scenario will develop. Different sensors acquire the vehicle's surroundings, and the sensor data is then analyzed and merged in the ECUs. Data from a wide range of sensors must be recorded and transmitted synchronously. By means of the sensor data fusion, one obtains a complete picture of the vehicle environment. By using recorder solutions with consistently scalable architecture, developers of driver assistance systems obtain very flexible systems that can be expanded to a nearly unlimited extent. The data rates of 500 to 700 MByte/s required in current autonomous driving projects for the storing of radar, video and ECU data can still be managed at the present time with just a single PC. As requirements increase, investment security is ensured by the VX1000 hardware – which can be used for both ECUs as well as for raw sensor data – and by the scalability of the complete solution. The complex hardware and software environment for autonomous driving raises the question of how release processes for this systems can be designed. When heading at full speed into the new ADAS world, it is better if there is no risk to any of the parties involved. How do we handle the current IT paradigm change in a way that makes the testing of all the functions truly reliable? Do we need more complex or completely different tools? Or would the skillful use of existing tools be a suitable approach? Due to the ever-increasing complexity of driver assistance functions, combined with the integration and fusion of different sensors, it is necessary to evaluate the performance of those systems as early as possible in the development cycle. Ideally, this is done automatically and already during the modeling phase. If vehicle dynamics influences the detection performance of the sensor system, or limiting cases need to be taken into account, the test system also needs to be able to test the Device Under Test (DUT) in a closed-loop. Having appropriate, application-specific metrics – especially for the validation of data fusion – is another requirement. The case study shows a solution based on tools from TASS, BASELABS and Vector. This measurement and calibration tool lets you acquire sensor and ECU data, optimize an algorithm and stimulate real or virtual ECUs. This optional CANape extension lets you verify the results of the ADAS algorithms. Detected objects from the vehicle are shown from a bird's eye perspective and superimposed on the video image. vADASdeveloper provides an infrastructure for developing algorithms for advanced driver assistance systems and automated driving. The tool reduces your workload in developing sensor data fusion applications. Algorithm framework for the data fusion of camera, radar and LIDAR and the efficient development of data fusion applications for series production. BASELABS Create Embedded enables dynamic object fusion for automated driving functions – from prototyping to series production. This measurement and calibration hardware utilizes the standardized XCP-on-Ethernet protocol for high-performance data transfer between the ECU's controller interface and the PC. MICROSAR ETH gives you an AUTOSAR-based communications stack for exchanging data in automotive Ethernet networks. MICROSAR.ETH provides the necessary functionalities and flexibility for new types of ADAS applications. You can use MICROSAR AVB to transfer your Ethernet-based audio and video data that is necessary for assistance systems. The extensive lineup of MICROSAR Safe products lets you implement safety-related applications according to ISO 26262. Protect your applications against external attacks with MICROSAR Security. In Car2x radio communications, you can use the cryptographic algorithms it contains – such as Message Injection and Man-In-The-Middle Attacks. MICROSAR SYS lets you time-synchronize distributed applications on a wide variety of networks (CAN, FlexRay, Ethernet). For instance, a common time base makes it possible to merge measurement data from different sources. Developing ADAS data fusion efficiently: Watch 2 recorded webinars!